Posted on October 13, 2017 by Matthew Leib. This entry was posted in Faculty Friday, Spotlight and tagged Faculty Friday, Spotlight. Bookmark the permalink. If you’ve ever helped a parent or family member use the internet to research health symptoms or decipher a prescription, you’ve participated in what Carmen Gonzalez and her research team call a brokering interaction—helping someone bridge a language or skills gap in order to access information and resources. Gonzalez, an assistant professor in the Department of Communication at the University of Washington, studies health equity and digital literacy—specifically, how immigrant families access online and community resources to address health-related needs. Gonzalez says it’s one thing to have digital tools and internet access, but another thing to know how to navigate the web to its most beneficial end. She recently finished collecting data for the first UW Search and Brokering Study with research partner Jason Yip from the UW iSchool and a team of postdoctoral, graduate, and undergraduate research assistants. The bilingual and interdisciplinary team conducted up to three in-home visits with 24 Latino families in Seattle to ask parents and their children if they’ve ever looked up online information together and, if so, what that looks like—in many cases observing first-hand how digital family collaboration is important for health and wellbeing. “We have to get better at fostering both language and technical skills by leveraging family assets, because health literacy is now increasingly tied to digital literacy as more services and resources move online,” Gonzalez says. She would know. Growing up in Los Angeles as the child of Mexican immigrants, she often found herself in the position of language broker as her parents learned English—a language Gonzalez herself only began speaking in first grade—and navigated their new environment. Even while adjusting to life in Los Angeles, her parents still found time to give back; Gonzalez recalls making annual trips to Tijuana, Mexico to deliver supplies to an orphanage as a family tradition. “My parents’ generosity made me always remember to consider the wellbeing of others,” she says. That lesson, along with her own experiences helping family members operate past obstacles, is what drew Gonzalez to research in the first place after a string of internships at Los Angeles-based lifestyle magazines as an undergraduate studying journalism at the University of Southern California left her feeling disconnected. “I became disillusioned with the type of writing I’d be able to do,” she says of the industry’s luxury- and shopping-focused editorial bend. Instead of continuing on the magazine track, she took a work study job as an office assistant for a research project, where she got in the habit of reading the academic material she’d photocopy for graduate students. Under the mentorship of USC professor Sandra Ball-Rokeach, she began conducting research with the Metamorphosis Project, which investigates the transformation of urban community under the forces of globalization, new communication technologies, and population diversity. “Working on projects that actually went into communities to run focus groups and interviewed voices that we don’t usually hear made me feel like this was work I could do and continue in academia,” she says. Ball-Rokeach encouraged Gonzalez to pursue her Ph.D.
During graduate school, Gonzalez participated in a multi-level study that looked at sources of health information for Latinas in L.A., who were dying of cervical cancer at higher than average rates. After completing her Ph.D., Gonzalez decamped to Rutgers University for post-doctoral work, which included a partnership with the Joan Ganz Cooney Center, an independent research and innovation lab that focuses on the challenges of educating children in a rapidly changing media landscape. Operating from Sesame Workshop, it was quite literally on the social science side of Sesame Street. There she began thinking more about equity and difference, a focus that she brought with her to the UW. But even with such encouragement, there’s much work to be done. 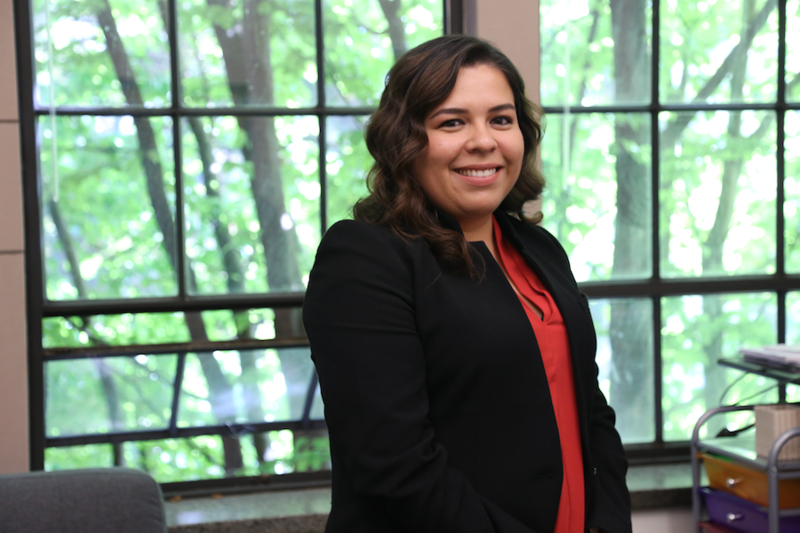 From her past decade of work in the field, Gonzalez believes the best way for academics to do impactful research is to cultivate community partnerships. Such is her conviction that she’s even developed a graduate seminar around methods and methodologies of conducting sound research in conjunction with community partners. Students who will, in turn, begin to help others—a perpetuating cycle Gonzalez has only just set in motion. Carmen Gonzalez holds a B.A. in Journalism and a Ph.D. in Communication from the University of Southern California.